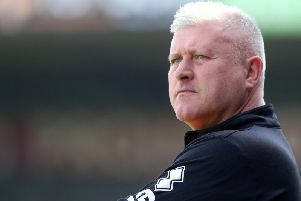 Lee Clark questioned his Blackpool side’s fight, energy and belief after they matched an unwanted 106-year-old record. That’s how long it is since Pool last went through a whole season without winning a match away from home. Eoin Doyle scored two penalties to add to Joe Mason’s goal as Cardiff beat the relegated Seasiders 3-2 in South Wales on Saturday, stretching Pool’s winless run in the Championship to 17 games. Andrea Orlandi’s strike had given Pool hope after they reached half-time 2-0 down, but this was dashed by Doyle’s second spot-kick, despite makeshift striker Peter Clarke scoring in stoppage time. A much-improved second-half display couldn’t gloss over the first 45 minutes for Clark, who said: “We didn’t show any belief, fight or energy in the first half. “At times you’d have thought we were 2-0 up and playing the game out. “People weren’t getting into position quickly enough, and you just cannot give away goals like their first two and expect to win games. “We got in their faces but we hadn’t done that at all in the first-half. Pool gifted the Bluebirds only their second win in 11 home games with two penalties after sloppy defending from first Henry Cameron and then Miles Addison. While Clark conceded Cameron’s was a correct call, he was quick to dispute the second spot-kick. The Pool boss added: “The goal that has ended up winning the game was not a penalty and it certainly would not have been given down the other end. “It was not a foul. Those are never given in any (level of) football, not even in my little boy’s academy, so we are disappointed that ends up being the winning goal. “The first one is a stonewall penalty because we didn’t sprint there quickly enough to get the ball. “If you go flat out and get there quickly, you end up having more time. With Gary Madine limping off just after the break and Nathan Delfouneso left out of the squad, Clark threw defender Peter Clarke up front for the second half. And Clark felt the gamble worked well. He added: “Gary had to come off with a heel injury that he got in the first couple of minutes. “Peter Clarke is a centre-half by trade but he went up and played a striker’s role, got three chances, showed desire and scored a goal.